This French language adventure series, alternately titled Les Aventures de Dan Cooper” was created by Belgium cartoonist Albert Weinberg (9 April 1922 – 29 September 2011) in 1954 for Tintin magazine in order to compete with “Buck Danny” published by Spirou magazine. It was a remarkable success appearing in 44 books from 1957 till 2010. The initial procedure was to publish it in serial format in the weekly Tintin magazine, then gather the episodes into a story which was published in book format. Editions du Lombard, published the first 19 books from 1957 to 1979. Editions Fleurus brought out the next 3 books 1979 to 1980. Novedi followed with 10 editions 1987 to 1989, followed by Dargaud with 5 books 1989 to 1992. In 2004, Loup and BD Club Genève each did a book, then Hibou picked up the title 2005 to 2010 publishing 5 books. Three of the stories were done by Jean-Michel Chartier. 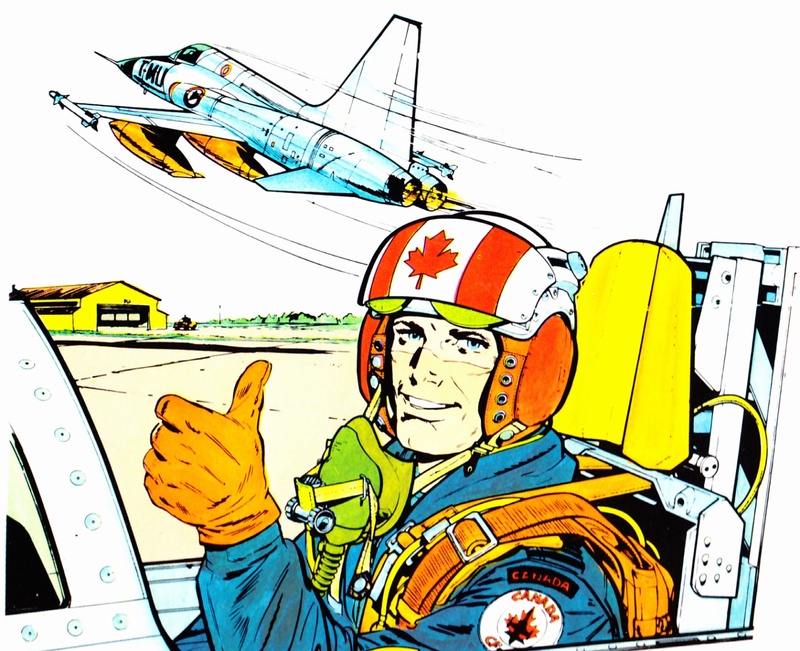 “Major Dan Cooper” was a test pilot for the Royal Canadian Air Force. The series began as science fiction which directly competed with “Buck Danny”. The early adventures included travelling to the Martian moon Demo. The series became more realistic with time but “Cooper” still occasionally encountered blue-skinned humanoid extraterrestrials. Front & Back: Illus., Albert Weinberg. Dan Cooper: Azimut Zero. Novedi, 1984. Front & Back: Illus., Albert Weinberg. 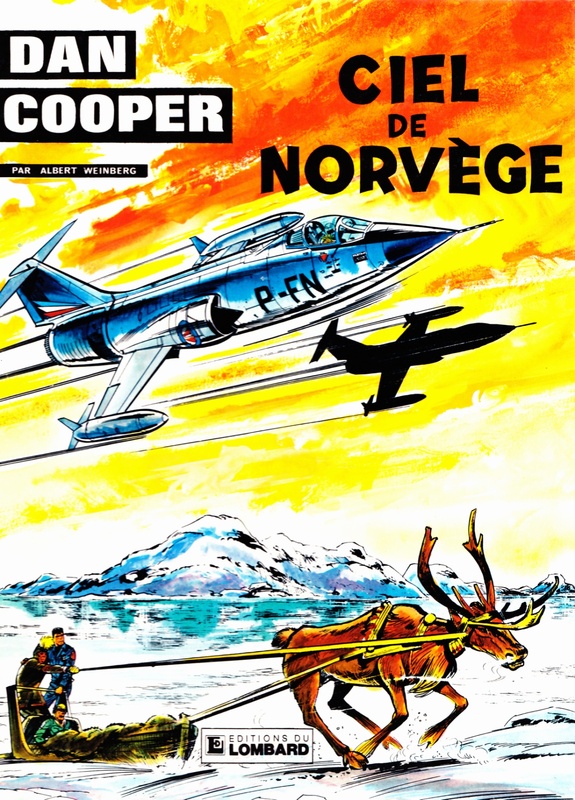 Dan Cooper: Ciel de Norvège. Editions du Lombard, 1971. Dan Cooper: Azimut Zero. Car., Albert Weinberg. Novedi, 1984. Dan Cooper: Ciel de Norvège. Car., Albert Weinberg. Editions du Lombard, 1971. “Albert Weinberg.” Wikipedia, the free encyclopedia. 23 July 2017. Accessed, 13 December 2017. “Dan Cooper.” Wikipedia, the free encyclopedia. 3 September 2017. Accessed, 13 December 2017. “Dan Cooper: Cool French Comics.” www.coolfrenchcomics.com/dancooper. Accessed 21 Dec. 2017. Illus., Albert Weinberg. Azimut Zero, 1984: Back cover. Illus., Albert Weinberg. Ciel de Norvège, 1971: Front cover.